Henry Timrod, (December 8, 1828—October 7, 1867), was called The Poet Laureate of the Confederacy by famed Victorian era poet Alfred Lord Tennyson. Although he never achieved the international fame of his near-contemporaries Whitman and Longfellow, Timrod was the most renowned and well-known poet of the American South, and he is one of the most important regional poets of the nineteenth century, often compared to Sidney Lanier and John Greenleaf Whittier. Timrod wrote in the style of mid-nineteenth century Victorian verse, and although he is not considered a very innovative poet in his technique, he is unique among nineteenth-century American poets because of his position in American history. One of the few truly accomplished literary figures to write in the brief-lived Confederate States of America, Timrod provides historians and readers with an invaluable glimpse into the intellectual history and culture of the American South in the midst of the American Civil War. Although Timrod remains controversial, and justly so, for his ideological support of the Confederacy and slavery, he is one of the few writers of significant literary talent who can aid us to see the history of nineteenth-century America from a Southerner's perspective. This this perspective is not one that we can now endorse, it does show the cost of the epic struggle between good and evil that took place during the War Between the States. In addition to the perspective Timrod offers to historians and those interested in the history of the United States, Timrod is also notable as a poet who, though not technically innovative, was nevertheless one of the most technically masterful poets of 19th-century America. The easy language of Timrod's lines and his thorough command of rhyme and meter have drawn comparisons with Wordsworth, Browning and Tennyson. Timrod may be a secondary figure in American poetry — overshadowed, as he was, by some of the most influential figures in the history of poetry — but he is nonetheless a major contributor to the history of America and American literature. Timrod was born in Charleston, South Carolina to a family of German descent. His father was an officer in the Seminole Wars and a poet himself. Timrod studied at the University of Georgia, but, forced by illness to end his formal studies, returned to Charleston. He took a position with a lawyer and planned to begin a law practice. From 1848 to 1853 he submitted a number of poems to The Southern Literary Messenger, under the pen name Aglaus, which attracted some attention to his abilities. Encouraged, he left the field of law for writing and tutoring. In 1856, he accepted a post as a teacher at the plantation of Col. William Henry Cannon in the area that would later become Florence, South Carolina. The single room school building, still preserved in Timrod Park, located in Florence, was built to provide for the education of the plantation children. Among his students was the young lady who would later become his bride and the object of a number of his poems—the fair Saxon Katie Godwin. Yet no tradition hath preserved his name. A sigh of pain, and sounds of elvish laughter. And he repaid them with the tenderest love. Saw thoughts like sinless Angels peering through. With the outbreak of war, Henry returned to Charleston, soon publishing his best known poems, which drew many young men to enlist in the service of the Confederacy. His best known poems of the time are Ethnogenesis, A Call to Arms, Carolina, and Katie. He was a frequent contributor of poems to Russell's Magazine and to The Southern Literary Messenger. Timrod soon followed those he had inspired into the military, but illness prevented much service, and he was sent home. After the bloody Battle of Shiloh, he tried again to live the camp life as a western war correspondent for the Charleston Mercury, but this too was short lived as he was not strong enough for the rugged task. 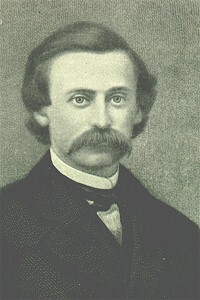 He returned from the front and settled in Columbia, South Carolina to become associate editor of the newspaper, The South Carolinian. In February 1864, he married his beloved Katie, and soon had a son, Willie, born on Christmas Eve. During the occupation by General Sherman's troops in February 1865, he was forced into hiding, and the newspaper office was destroyed. The aftermath of war brought poverty to his family and to him, increasing illness. He took a post as correspondent for a new newspaper based in Charleston, The Carolinian, but after several months of work, he was never paid, and the paper folded. His son Willie soon died, and Henry joined him in death, of consumption in 1867. The shaft is in the stone! Stoop, angels, hither from the skies! Later critics of Timrod's writings, including Edd Winfield Parks and Guy A. Cardwell, Jr. of the University of Georgia, Jay B. Hubbell of Vanderbilt University, and Christina Murphy, of the University of Connecticut, have indicated that Timrod was one of the most important regional poets of nineteenth-century America and one of the most important Southern poets. In his achievement, Timrod is often compared to Sidney Lanier and John Greenleaf Whittier as poets who achieved significant stature by combining lyricism with a poetic capacity for nationalism and political argument. All three poets also explored the heroic ode as a poetic form. In 1901, a monument with a bronze bust of Timrod was dedicated in Charleston, South Carolina. But perhaps the greatest honor paid to him by his fellow patriots was in 1911, when the General Assembly passed a resolution instituting the verses of his poem, "Carolina," as the lyrics of the official state anthem. Cisco, Walter Brian. Henry Timrod: A Biography. Fairleigh Dickinson University Press, 2004. ISBN 0838640419. Faint Falls the Gentle Voice of Prayer A prayer for peace penned by Timrod (words and audio). This page was last modified on 18 December 2017, at 17:04.